So, I'm taking a little hiatus until Saturday to study for my first two finals (one of which I'm pretty sure I'm going to bomb). I have so many outfit pictures that have been slowly building up. I have to admit, lately I've been dressing like a bum because it's so humid out to the point where I just want to lay in bed next to a million fans and just sleep. It's hard to sleep on my bed though considering my room is a complete and utter mess. That's my side of the room, don't judge me, haha. I swear it's not like this year round. Good luck with finals. Can't wait to see the outfit pics. Looks like i'm not the only brave one! Actually i love the way your room looks. There are lots of new looking clothes, pretty feminine colours, and despite a few things not being folded and tucked away everything looks clean and relatively organized. My own room isn't nearly that clean (i'm way tardy with my vacuuming). Rest up and best wishes for success! Good luck on your finals! Your room is a disaster! But I love the curvy pattern you organized picture frames on the wall. Very cool! Good luck with your finals! I'm sure you'll do fine. And it's funny. 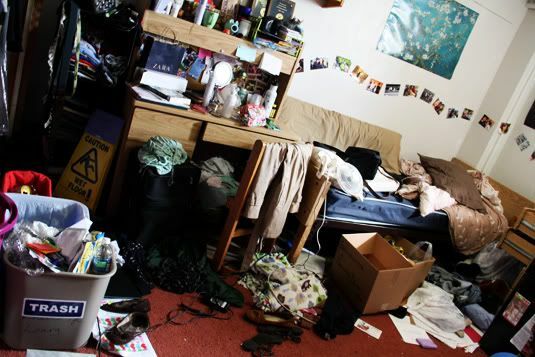 Your room very well resembles mine at the moment due to my inability recently to get myself to do anything about it. haha I need to get on that! Good luck studying and dont forget after your exams to clean up ahaha ;)! Weird, do all college dorms have the same furniture? WHOA!!! where do you sleep??!! :) I hope some cute new things show up in your closet for me to shop from when you have the time to go through and organize your stuff. ;) I am taking my new pink purse out for a spin during dinner tonight (hopefully)!! hahaha trust me, my apartment looked EXACTLy like this. Wow! I love those pics on the wall! Like a wave... Is cool. Haha if you think your room is bad, you should see mine :) Good luck on finals! hahahha.. good luck with your studies jen ! hope you can get back to daily blogging again ! I don't even want to know why there is a "wet floor" sign in your room. Do I need a HAZMAT suit to enter? And if you keep thinking you're not going to ace the test, then you may not, so stop that train of thought! hi babe! good luck on ur exams!!! im sure you wont bomb them!!! AHAHA that looks like my room around exam time as well :P good luck with them kiddo! Good luck with your exams, Jen! I think you'll do great! Exams are scary, I have four exams + more tests(practical) coming up.. I'm anxiously waiting for the outfit posts, because 'yes', you inspire me! I'm totally experiencing finals-related crunchtime as well, though I tend to clean as a way of procrastinating. Good luck with your year-end busy-ness! caN u cLeaN uP aNd MaKe Up uR RoOM? LOL Jen! That looks just like my bedroom--I can relate! this was how my room used to look like in highschool and college!!!hehe. now, i try to keep it as tidy as possible but there's still piles of clothes from the laundry that's on my dresser...just can't find time (or am too lazy) to put them and sort them in my closet...LOL. anyway, thanks for the mapping generator link...it's very useful indeed. allows you to map exactly where you want the links to be.. I have an award for you! It's the Sweet Award! That is AMAZING. It looks just like my room! I hope you're doing well Jen!... and made some time to have some fun this weekend! HUGS. Looks like i'm not the only brave one!